Paint-on semiconductors; welding with nanotech; Ethereum flaw. Hybrid semiconducting materials have quantum properties capable of bringing significant changes to light-emitting diode lighting and monitors, along with photovoltaic solar cells, researchers at the Georgia Institute of Technology report. Physical chemists worked with halide organic-inorganic perovskite (HOIP), which combines a crystal lattice with a flexing material layer. This hybrid semiconductor material can be painted on to LEDs, lasers, and window glass, making them glow in a variety of colors, with minimal electrical energy. Perovskite materials have been adapted in solar cells before, yet HOIPs promise to make solar panels more efficient in energy conversion, while also reducing production costs, compared with silicon-based solar cells, according to Georgia Tech. “One compelling advantage is that HOIPs are made using low temperatures and processed in solution,” Carlos Silva, a professor in Georgia Tech’s School of Chemistry and Biochemistry, said in a statement. “It takes much less energy to make them, and you can make big batches.” Silva collaborated with Ajay Ram Srimath Kandada, a researcher at the Istituto Italiano di Tecnologia in Milan, Italy, who was a visiting researcher at Georgia Tech for a year. Researchers from the Université de Mons in Belgium also worked on the project. An aluminum alloy designated as AA 7075 was developed in the 1940s for automotive manufacturing. The alloy proved to be unusable when it was welded, which caused an uneven flow in its elements of aluminum, copper, magnesium, and zinc, resulting in cracks along the weld, which cannot be tolerated in automotive vehicles, although the alloy is almost as strong as steel and weighs two-thirds less than steel. Engineers at the UCLA Samueli School of Engineering infused 7075 alloy welding wires with titanium carbide nanoparticles, which produced welding joints with a tensile strength of up to 392 megapascals, which compares with the AA 6061 aluminum alloy, which has a tensile strength of 186 megapascals in welded joints. The research team also found using post-welding heat treatments could improve the strength of AA 7075 joints up to 551 megapascals, comparable with steel. 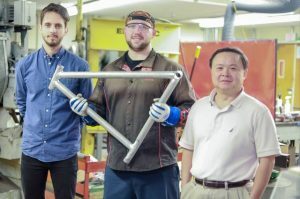 “The new technique is just a simple twist, but it could allow widespread use of this high-strength aluminum alloy in mass-produced products like cars or bicycles, where parts are often assembled together,” says Xiaochun Li, UCLA’s Raytheon Professor of Manufacturing and the study’s principal investigator. “Companies could use the same processes and equipment they already have to incorporate this super-strong aluminum alloy into their manufacturing processes, and their products could be lighter and more energy efficient, while still retaining their strength.” The researchers are working with a bicycle manufacturer on prototype bike frames that would use the alloy, and the new study suggests that nanoparticle-infused filler wires could also make it easier to join other hard-to-weld metals and metal alloys. The Ethereum blockchain platform was nearly upgraded this month with a significant cybersecurity vulnerability that could have compromised the platform’s capability to secure smart contracts. The flaw was uncovered by Hubert Ritzdorf, the chief technology officer of ChainSecurity, a spinoff from ETH Zurich. Ritzdorf, a former doctoral student at ETH, notified the Ethereum core team, which called off the upgrade scheduled for Jan. 16. “If the upgrade had gone ahead as planned, malicious users could have attacked certain contracts and then been able to raid the accounts of other users,” Ritzdorf says. ChainSecurity was established one year ago by Ritzdorf, Tsankov, and ETH Professor Martin Vechev.